THE BOOK OF LIFE is a breathtaking animated comedy with a dazzling visual style unlike anything you’ve seen before. Torn between the expectations of his family and the desires of his heart, a young man named Manolo sets off on an epic quest that spans three spectacular worlds in order to reunite with his one true love and defend his village. Not your ordinary fairy tale, THE BOOK OF LIFE is a wondrous fantasy-adventure filled with magic, music and fun! It comes out on Blu-ray/DVD on Jan. 27, 2015. Twentieth Century Fox Home Entertainment invites you and your family to join Manola, Maria and Chuy as they embark on a magical journey that takes them on an adventure of a lifetime. 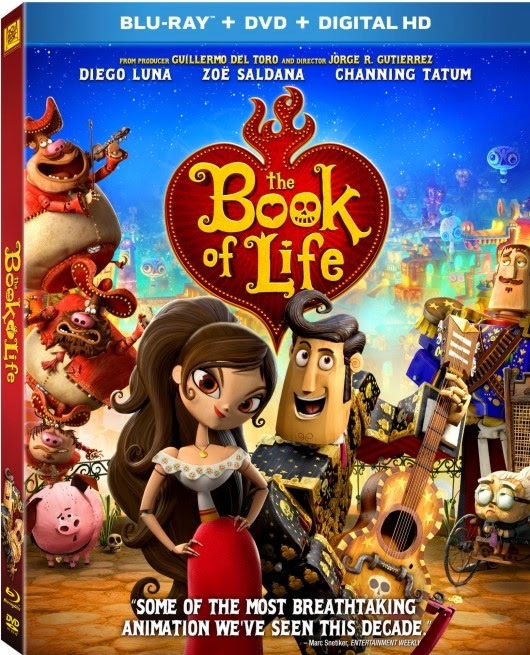 Win it: One lucky reader will win a The Book of Life Blu-ray/DVD. This giveaway will end February 11th at 12:00 AM EST. The winner will have 48 hours to respond to my email. If no response, a new winner will be chosen. Open to residents of the US. NO I haven't seen this movie, but from the clips it looks like a good one. I plan to watch it with my family. We haven't seen it (though for some reason Alysia has a lunch box of these characters). I really like the animation style though. I have not seen it yet. I plan to see it with my son and grandson. No I haven't watched it yet. I saw it and thought it was pretty good! I'd like to see this with my husband. I have not seen this movie . I think it would be a fun movie to watch with my family. No, I have not seen it. Would love to see it with my daughter in law. I have not seen this yet and I would watch it with my family. I Have Not Seen This Movie Yet, I Plan On Watching This With My Niece And Nephew. I haven't seen the Book of Life yet. My whole family would watch it together. I have not seen this movie yet, but would love to see it with my mom. We love animated movies. We did not get the chance to see this in theaters. I would love to see if with my kids and their dad if I won. The previews looked excellent. Yes, I have seen this movie & we really enjoyed it! My kids want to see it again! Our family has not yet gotten to see The Book of Life but we are all really excited to watch it during our weekly movie night once it's released on DVD/Blu-Ray and/or Netflix! I have seen it and i love it. It has great songs on it. We have not seen it but I think it will be interesting to see a different kind of fairy tale than your typical one. I have not seen it yet. I would love to watch this with my husband and our three boys. My kids would love it, we haven't seen it. I watched it with my kids. I liked the music. I haven't seen it but would love to watch it with my whole family!